© 2002  32 fully illustrated 4-color pages in each book. A collection of all four titles in the Enjoy Your Cells series for one low price. 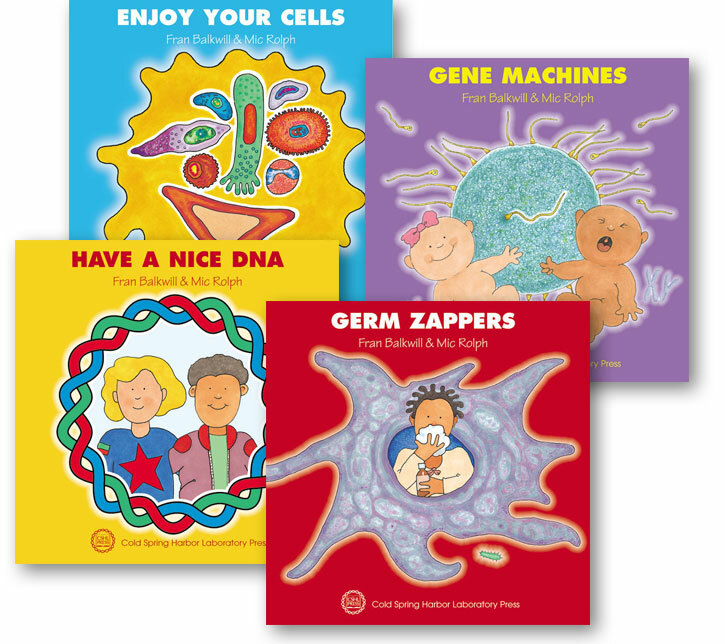 Enjoy Your Cells is a new series of children's books from the acclaimed creative partnership of scientist/author Fran Balkwill and illustrator Mic Rolph. Once again, they use their unique brand of simple but scientifically accurate commentary and exuberantly colorful graphics to take young readers on an entertaining exploration of the amazing, hidden world of cells, proteins, and DNA. here in these books are the basic facts behind the public debates. With these books, children will learn to enjoy their cells and current affairs at the same time. And they're getting information that has been written and reviewed by working scientists, so it's completely correct and up-to-date. Readers aged 7 and up will appreciate the stories' lively language and with help, even younger children will enjoy and learn from the jokes and illustrationsno expert required! This series is a must for all elementary school students and those who care about educating them to be well-informed in a world of increasingly complex health-related and environmental issues. Fran Balkwill is Professor of Cancer Biology at St. Bartholomew's Hospital and the London Queen Mary School of Medicine. Mic Rolph is a graphic designer with much television and publishing experience. Together, they have created many books for children, and have won several awards, including the prestigious COPUS Junior Science Book Prize.